Senior Rafaela Frota developed the idea for Wawwe, Inc. (We Are What We Eat) when she was 14. Now she's achieved major praise for her nutrition-assistance app . Senior photonic science and engineering major Rafaela Frota's win at the Joust New Venture Competition marks the first time a female-led technology venture has taken the top spot. At just 14 years old, Rafaela Frota founded Wawwe, Inc. (We Are What We Eat) to achieve her dream of making people more easily aware of their nutritional needs and how they relate to their diet. 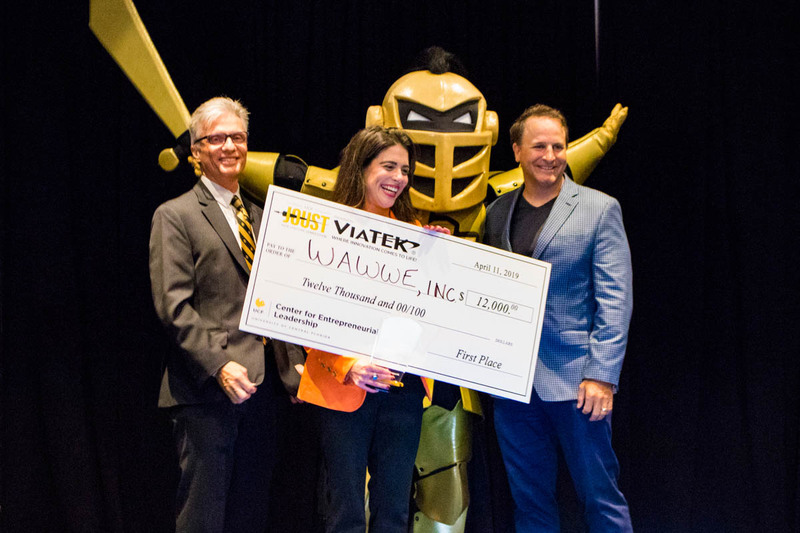 Eight years later, armed with a business proposal and partnerships with three major health care networks, the UCF senior and her teammates Jarod Smith and Isaac Vaughn led Wawwe to the top prize at the Joust New Venture Competition, UCF’s version of Shark Tank. Wawwe beat out three other student businesses Thursday to take home a $12,000 check and more than $50,000 in essential business services. In a similar fashion to NBC’s hit show Shark Tank, Frota pitched Wawwe, Inc., to a panel of judges representing companies such as Viatek Consumer Products Group, Darden Restaurants and Deloitte. 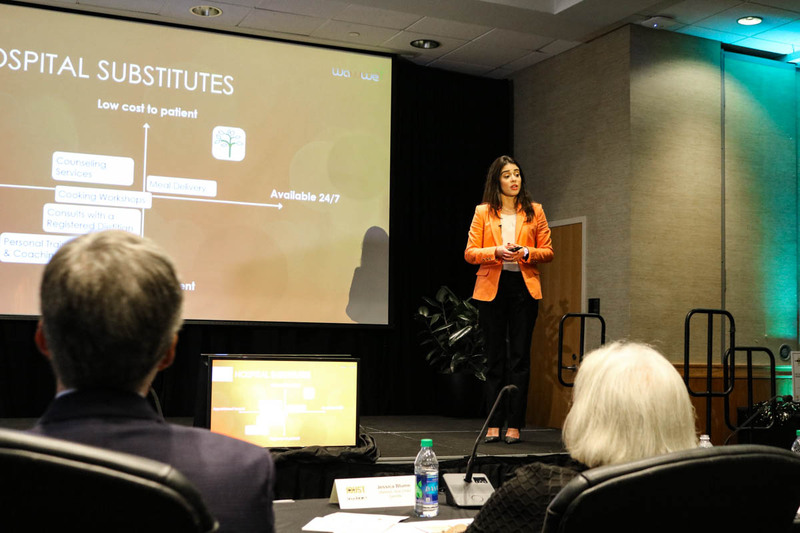 In front of a crowd at the FAIRWINDS Alumni Center, Frota won over the judges with her company’s mobile app that provides meal, recipe and grocery recommendations tailored to each user’s dietary needs. Frota and her teammates plan to use the competition winnings to begin pilot studies and to expand on her company’s partnerships with health care providers and hospital networks. Wawwe has already secured a contract to begin testing the app with 500 hospital patients. Senior photonic science and engineering major Rafaela Frota presents her pitch for Wawwe Inc. at the 2019 Joust New Venture Competition. The Joust is UCF’s premier startup showcase event presented by Viatek Consumer Products Group and featuring students of all majors. Competitors present their models for a viable business venture and compete to win money and other resources to pursue their venture. Lou Lentine ’93, president of Viatek Consumer Products Group and a UCF College of Business graduate, decided to partner with his alma mater to support the next generation of UCF entrepreneurs. All four finalists in this year’s competition included elements of a social venture—a business idea that aims to incorporate business skills and techniques to solve societal problems. Cameron Ford, director of the UCF Center for Entrepreneurial Leadership, called this year’s Joust an incredibly close competition. The Joust runners-up were Briana “Breezy” Baldwin and Eliecer Vera with Ridesurf, a company that aims to connect long-distance riders by allowing drivers to sell extra seats in their car to available riders. They took home $7,000. David Thomas Moran ’14MFA and Nathan Selikoff ’04 earned third place and $4,000 for their company, Omnimodal. Omnimodal’s Mobilize navigation app captures real-time commuter data to help passengers better utilize public transportation. Brite and the team of Jake Hartigan, Alexandra Kalyuzhnaya and Alex Petukhov earned $2,500 for their fourth-place finish and their idea to help small investors crowdfund stock, equity and real estate projects. The students’ venture proposals were assessed by a panel of business executives representing a wide range of corporate partners, local businesses and alumni. This year’s judges were Jessica Blume ’80, retired vice chairman and board member at Deloitte; Rick Cardenas ’92, CFO for Darden Restaurants; Lou Lentine ’93, president and founder of Viatek Consumer Products Group; Kevin Miller, president and CEO for Addition Financial, formerly known as CFE Federal Credit Union, and Rick Walsh ’77, ’83, ’14, president of Knob Hill Group. The 2019 Joust New Venture Competition was presented by Viatek Consumer Products Group. Supporting sponsors included 321 The Agency, BDO, Blezoo, Burr & Forman, Microsoft, Nperspective LLC and South Street & Co.